We are very happy your can checking out our FAQ page. These are the most commonly asked questions we receive, so we thought it would be a good idea to post them for everyone to see. We pride ourselves on honesty about our business and think you’ll find these most helpful when ordering from us. Any additional questions you may have, please feel free to shoot us an email and we’ll get you an answer as soon as possible. We aim to please and strive to make ordering from our website a painless and happy process. 1. Are the prices on your website in US Dollars? 2. How long do international orders take to arrive? 3. Is shipping free for orders going outside the US (international) also? 4. When do out-of-stock items usually become available to purchase again? 5. What if I receive a defective item? 7. Can I return my purchase? 8. Do you offer the ability to split payments across two payment methods for my purchase? 9. How do I find your best offers & discounts? 10. Are the watches you sell 100% authentic? 11. My first transactions were declined. Why are there multiple charges showing on my credit card account? 12. My watch's battery died within 30 days of receiving the watch, what do I do? 13. What do the water resistance ratings mean? 14. I entered the wrong shipping address. How do I update this? 15. What are the duties required for my country? 16. I received an email to contact you to confirm my order. What do I have to do next? 17. How long will it take for my exchange/return to be processed? They sure are! Our site located in the United States and all of the prices on the site are in US Dollars. For the latest currency exchange rates, please contact your local bank for updated information. Well, that all depends on where you’re located. We ship to Europe and Asia daily and orders typically arrive within 10-14 business days at the most. Canada, Mexico, Australia and South America can arrive in even less time (15-35 business days). We’ll do our best to safely and securely ship your order to your international destination as quickly as possible. Our inventory changes rather quickly and a lot depends on what popular brands and styles are in high demand. You can contact our customer service department buy email and we’ll do our best to track down what you’re looking for. Upon completion of your purchase, we will send you a confirmation email and a follow-up with the tracking information. Or you can login and checking out your person account at our site. Yes, you can return merchandise purchased on our website. Our return policy is 60 days, and merchandise must be returned with all original packaging, unworn and in brand new condition. To start the process, please contact us Monday – Friday 7 AM to 12 PM EST at email customer service at service@supwatch.com for further inquiries. For more information, please view our Return Policy here. The absolute best way to save the most money on your purchase is the receive our shopping alert email newsletters. Sign up here and you’re guaranteed to get first dibs on the best selections and exclusive pricing we have to offer on in-stock products. If you are browsing our selection online, you can also use the "sort by price" feature at your convenience. Are the watches you sell 100% authentic? Yes! All of our watches sold are 100% Authentic Guaranteed, brand new, unworn and come in the original manufacturer packaging (unless otherwise noted on the product page). My first transactions were declined. Why are there multiple charges showing on my credit card account? What you are seeing are temporary authorizations from your bank for the declined attempt and your financial institution should correct these within a few days as we have not and can’t process them. Please note that your credit card may be pre-authorized to verify funds are available. A pre-authorization is a temporary hold to verify that funds are available when you place an order. If your transaction is unsuccessful your credit card may be authorized, but that does not mean that it has been charged. It is not necessary to contact customer service to remove a pre-authorization, if you need assistance removing a pre-authorization from your credit card transaction history, please contact your bank or financial institution. My watch's battery died within 30 days of receiving the watch, what do I do? Most watch batteries can last over 2 years from when they’re first put into the watch. If the watch stops functioning, this is most likely due to a prematurely dead battery cell - which just needs to be replaced. Any qualified local watch repair store, jewelry store, or watchmaker can replace the battery for you. Visit our Contact Us page if your battery has died within the first 60 days. What do the water resistance ratings mean? Water Resistance indicates how well a watch is sealed against the ingress of water. It is usually accompanied by an indication of the static test pressure that a sample of newly manufactured watches were exposed to in a leakage test. An indication of the test pressure in terms of water depth does not mean a water resistant watch was designed for repeated long-term use in such water depths. 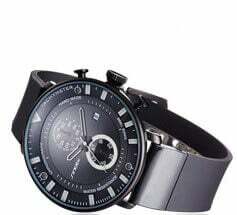 For example, a watch marked 3 ATM/30 meters water resistant cannot be expected to withstand activity for longer time periods in a swimming pool, let alone continue to function at 30 meters under water. This is because the test is conducted only once using static pressure on a sample of newly manufactured watches. The test for qualifying a diving watch for repeated usage in a given depth includes safety margins to take factors into account like aging of the seals, the properties of water and seawater, rapidly changing water pressure and temperature, as well as dynamic mechanical stresses encountered by a watch. Here are some activities that some brands use to illustrate water resistance. 10 ATM = Water Sports, suitable for swimming, surfing, etc. I entered the wrong shipping address. How do I update this? You must contact us within one hour of placing your order to update this info by emailing service@supwatch.com. Please include your name, order number and the correct address for faster processing. We will not be responsible for orders placed and shipped to the wrong address. In the event your order has been Returned to Sender (RTS), due to missed multiple delivery attempts or incorrect address provided, we will contact you once we receive the package back and an additional shipping fee will be needed before it can be reshipped. What are the duties required for my country? Most of our customers outside the US report little to no duties due - though potential import taxes might be imposed by your government and we can’t predict any possible duties/taxes that may be required in your country. Duties & taxes are not included in your order total and are the responsibility of the customer. I received an email to contact you to confirm my order. What do I have to do next? Our Fraud Protection Department works diligently to ensure our customers are protected. We may contact you in the event that we may need further verification before shipping your order. If you have any questions, feel free to email the Fraud Department at service@supwatch.com if you have any questions regarding this Customer Protection process. How long will it take for my exchange/return to be processed? Returns/Exchanges once received take approximately 2-5 business days to be processed. During the busy Holiday season once received can take anywhere between 5-10 business days to be processed. Once completed you will be notified by email.